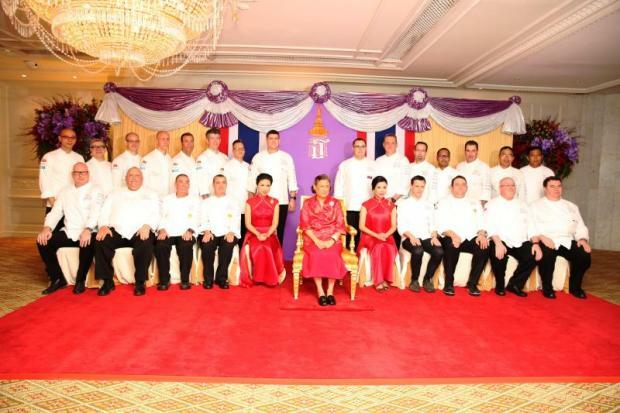 HRH Princess Maha Chakri Sirindhorn pictured with Patcharin and Nuntiya Hame-ung-gull of Gourmet One and the team of 22 chefs who participated in the 2019 Bangkok Chefs Charity Fundraising Gala Dinner, at the Mandarin Oriental, Bangkok. The height of glamour, the Bangkok Chefs Charity Gala Dinner is an affair marked by dazzling attire and luxurious food. But beyond this lies a warmhearted philanthropy, offering support to the less fortunate through world-class gastronomy crafted by an exclusive team of international chefs. 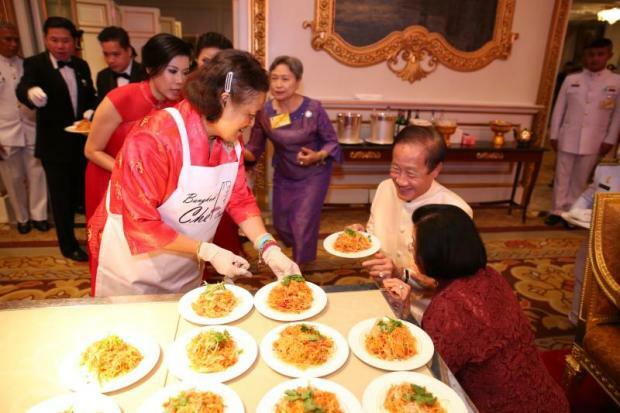 Held on the evening of Monday, Feb 4, the Bangkok Chefs Charity Gala Dinner 2019 has proved once again that giving is never out of fashion. 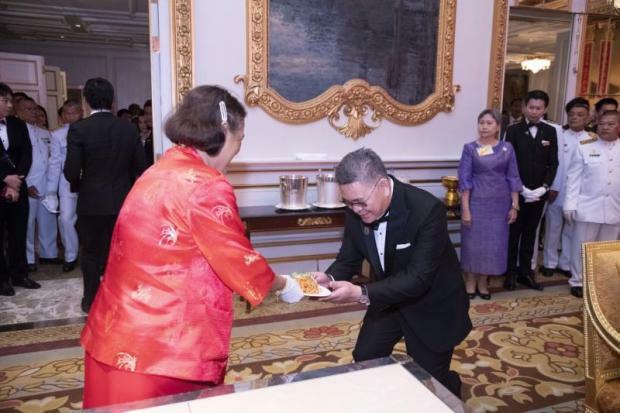 The event, graciously presided over by HRH Princess Maha Chakri Sirindhorn, raised an impressive 44 million baht for charity, the highest amount the annual event has achieved so far, since its inception 10 years ago. The project was initiated in 2009 by Nuntiya and Patcharin Hame-ung-gull of Gourmet One, Thailand's leading importer of fine foods. Taking advantage of their contacts and connections, the sisters came up with the idea of giving back to society while at the same time showcasing the quality, creativity and distinct style of Bangkok's foremost food and beverage professionals. In collaboration with the Mandarin Oriental, Bangkok, together with a number of chefs from 5-star hotels across the country and Thai Airways International, the project raises funds, through dinner ticket sales, auctions and donations, to help improve the quality of education and well-being of underprivileged schoolchildren in remote areas of Thailand. 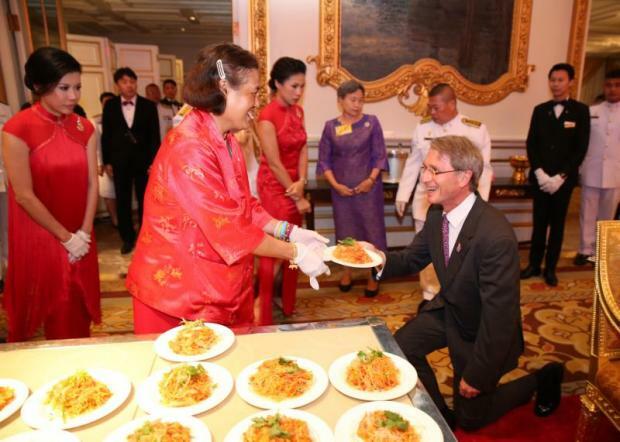 The first event saw 16 executive chefs participating, and raised 3.4 million baht. It was the first time in Thailand that executive chefs from several 5-star hotels got together to cook up a world-class meal for an altruistic cause. The number of participating chefs and the amount of money raised have continued to grow over the years. 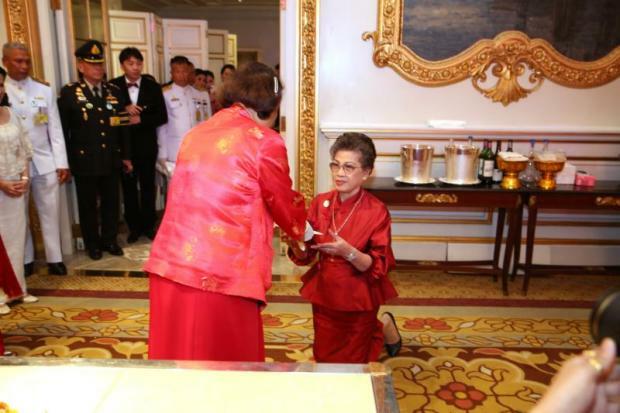 The 10th edition of the event took place four days ago in the Royal Ballroom of the Mandarin Oriental, Bangkok. 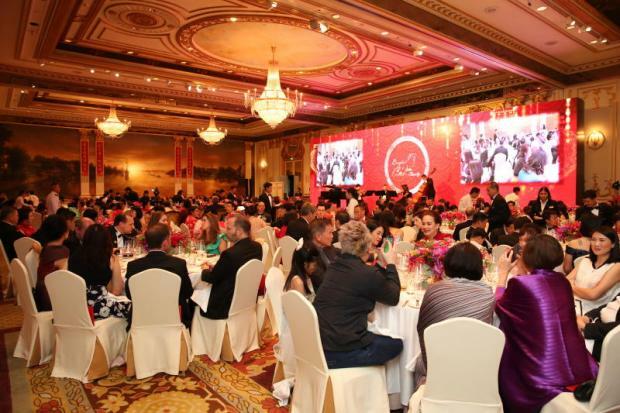 Coinciding with the Chinese New Year celebrations, the grand venue was decked out in bright red and attended by some 350 discerning epicures and philanthropists. 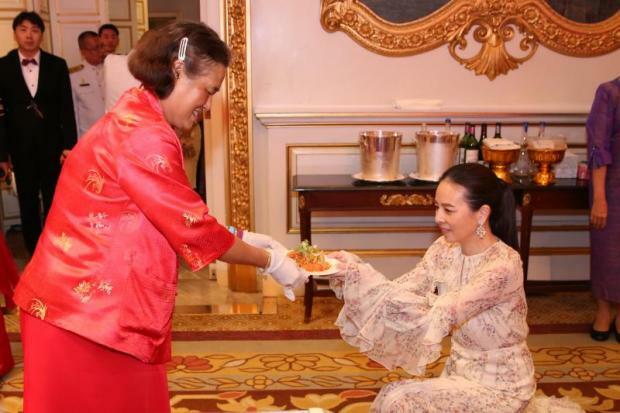 The Princess demonstrates how to prepare the prosperity toss salad. This year, the culinary creations highlighted the flavours of top-notch ingredients from the world's best sources, including prime quality products from the royal-initiated agricultural development projects under the Chaipattana Foundation. Accompanying the gala menu was a selection of fine wines, supported by Central Wine Cellar, all chosen from some of the world's best winemakers and regions. The evening kicked off with a cocktail reception in the Royal Ballroom's foyer. The reception canapés were created by the Mandarin Oriental, Bangkok's two Michelin-starred chef Arnaud Dunand Sauthier, and featured smoked eel cheesecake with tarragon; Szechuan soup bonbon; deep-fried wonton with drunken chicken and herbs; braised shiitake with duck liver; turnip cake with oyster and cucumber; and fuqui feipian beef millefeuille with spices and sesame. Accompanying the bite-sized delicacies was the 90-point Masi Conte Federico Millesimato Trento 2011, from Trentino, Italy. Following the welcoming cocktail session was an 11-course dinner in the ballroom, with live entertainment from Krungthep Light Orchestra and solo-pianist Darin Pantoomkomol. Held on the auspicious date of Chinese New Year's Eve, the event yielded a wonderful result. The meal officially began with a refreshingly light starter, drunken lobster with cucumber, green apple and celery, the work of chef Michael Hogan of Bangkok Marriott Marquis Queen's Park and chef Stefan Trepp of Siam Kempinski Bangkok. This was paired with the 95-point Hewitson Belle Ville rosé 2017, from Barossa Valley, Australia. Next up was a duet of Scottish salmon -- one marinated with red curry, the other house-smoked -- on tom yum panna cotta, pickled cucumber, red onion and turmeric cauliflower floret, by chef Gael Lardiere of the Athenee Hotel Bangkok and chef Kevin B. Thomson of JW Marriott Hotel Bangkok. The third course was seared Hokkaido scallops with crispy Yunnan ham, sorrel cress and XO sauce on a bed of sweet potato purée by chef Jan Van Dyk of Anantara Siam Bangkok and chef Markus Zuck of Grand Hyatt Erawan Bangkok. Both the second and third courses were matched with the 87-point Richter Mülheimer Sonnenlay Riesling Zeppelin 2016 from Mosel, Germany. Mesclun greens with avocado and tea oil vinaigrette came next, created by chef Marc Erwin Cibrowius of Shangri-La Bangkok and chef Pierre Andre Hauss of Thai Airways International. The salad was complemented by the 95-point Dog Point Sauvignon Blanc 2017 from Marlborough, New Zealand. The dinner moved on to the fifth course with pan-fried foie gras with pistachio crumble, black cherry gastrique and truffle jus by chef Alessandro Santi of the Waldorf Astoria Bangkok and chef Jose Martin Ruiz Borja of Angsana Laguna Phuket. An amber-hued soup, dubbed Oriental herbal tea with smoked pigeon and enoki mushroom, by chef Antony Scholtmeyer of Capella Bangkok and chef Shaiful Kassim of Millennium Hilton Bangkok was served next. Matching the duck liver and the soup was the 95-point Luna Estate Eclipse Pinot Noir 2016 from Martinborough, New Zealand. The next course was slow-roasted duck breast with cherry, hazelnuts and golden quail egg by chef Gaetano Palumbo of Sheraton Grande Sukhumvit and chef Matthias Mittnacht of Renaissance Bangkok Ratchaprasong. This was matched with the 90-point Les Vins de Vienne, La Perdendaille, Côtes du Rhône Village 2014 from Rhône Valley, France. 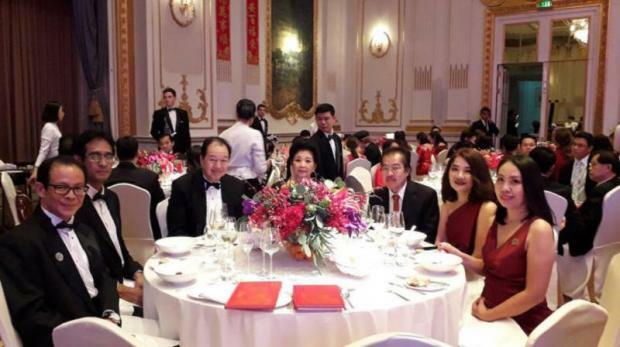 The evening's top donors, Prayuth and Suvimol Mahagitsiri. Preparing guest palates for the meat course that was to come was a superb pinkish-purple sorbet made with Chaipattana red cabbage, jalapeño peppers, passion fruit, orange and wild honey, all harvested in Chiang Rai, by chef Pisit Jinopong of Anantara Golden Triangle Elephant Camp & Resort. This year's dinner showcased two main courses. The first, roasted Australian rack of lamb with rosemary-hoisin sauce, lamb cromesquis and celeriac soubise purée, was a creation by chef Philippe Gaudal of the Landmark Bangkok and chef Somchai Deeying of Centara Grand & Bangkok Convention Centre at CentralWorld. The lamb was paired with the 90-point La Chapelle De La Mission Haut-Brion, Pessac-Leognan 2013 from Bordeaux, France. It was followed by beef fillet Wellington with heirloom carrots and smoked abalone sauce by chef Norbert Kostner and chef Dominique Bugnand of Mandarin Oriental, Bangkok. The dish was complemented marvellously by the 91-point Grand Cru Classe Château Pedesclaux Pauillac 2011 from Bordeaux, France. For the sweet finale, paired with the 87-point sweet and floral Clarendelle Amberwine 2012 from Monbazillac, France, was a dessert platter called Mandarin sphere with pistachio dacquoise, Mandarin gel and chocolate crumbles by chef Rolandao Manesco of InterContinental Bangkok and chef Stefan Leitner of the Peninsula Bangkok. The high-minded dinner was made possible by a top-notch venue, facilities and service at the Mandarin Oriental. The evening also revealed the chefs' hidden talents. Inviting everyone to join in, all 22 chefs went on stage to inspire guests with a singalong performance of We Are The World, while the screen showed footage of the team travelling to some of the remotest areas of the country to visit schools, where they cooked lunches and handed out educational supplies to thousands of schoolchildren. After this came the fundraising session conducted by celebrity emcees Surivipa Kultangwatana and Varin Sachdev. 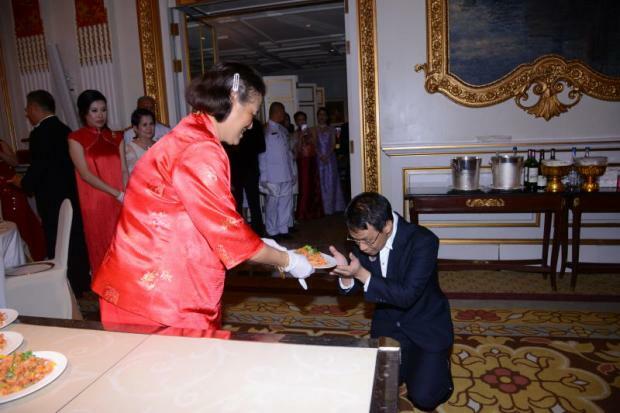 The highest pledge was by Prayuth and Suvimol Mahagitsiri, who topped the list with a generous donation of 15 million baht. As winners of the grand auction, the couple was granted an opportunity to have a gourmet meal cooked at their venue of choice by their selection of preferred chefs. Among the other generous donors were Harald Link, chairman and chief executive of B. Grimm; Nualphan Lamsam, president of Muang Thai Insurance; and Thanawat Trivisvavet, managing director of CK Power, who each donated 5 million baht. Wanchai Ruay-are also donated 4 million baht; Anan Raweesangsoon, 2 million baht; the WhiteSpace Company, 2 million baht; Botan Hame-ung-gull, 1 million baht; and MR Sasijuthapa Worrawan, 1 million baht. Benjawan Buhrman gave 500,000 baht; Orawan Taechaubol, 200,000 baht; Srisopha Kotkumlue, 200,000 baht; and Noppadol Intralib, 100,000 baht. 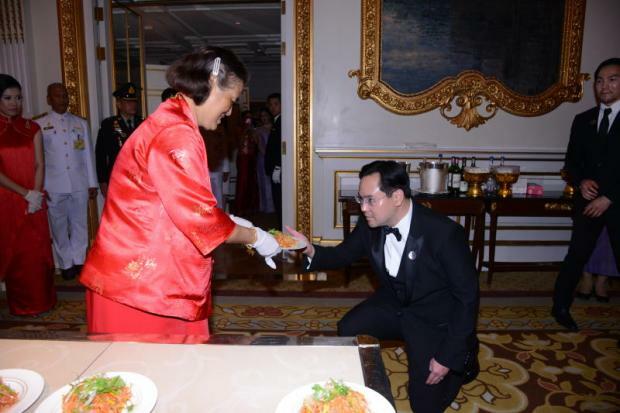 At the height of the evening, Princess Sirindhorn demonstrated to all guests the preparation of a Cantonese yee-sang salad. The salad, also known as the prosperity toss salad, is traditionally eaten at Chinese New Year and consists of raw salmon (to signify abundance), assorted fresh vegetables and nuts as well as variety of sauces. 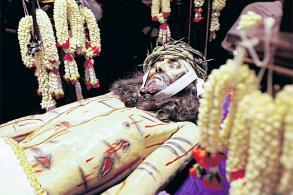 The Princess' creation was awarded to all 18 benefactors. There was an auction of handwoven shawls by Pagakayaw hilltribe people from the royally-initiated Phufa Shop. Twelve shawls were modelled during a mini fashion show and subsequently auctioned off for a total of 2.37 million baht. Before the evening ended, a donation of 630,00 baht was given by an anonymous donor to bring the total amount raised to 44 million baht. To date, the Bangkok Chefs Charity project has generated more than 176 million baht for the improvement of education and well-being of underprivileged children in remote areas across the country. 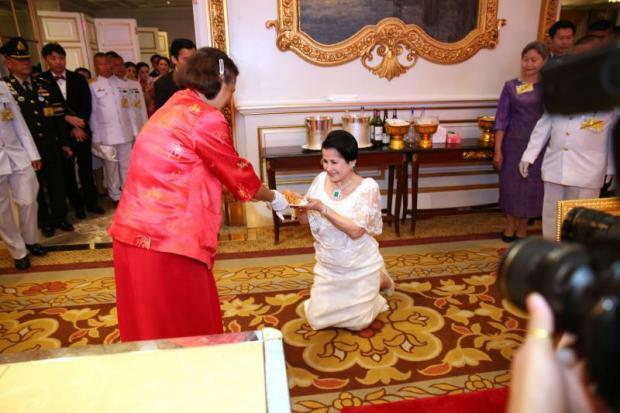 The majority of the fund has been donated to the Sai Jai Thai Foundation and the Border Patrol Police Schools under the patronage of Her Royal Highness. The rest has been used to improve buildings and facilities at needy schools in the North and the Northeast, as well as to provide school supplies, scholarships and food for young students. 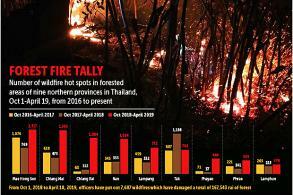 Last year, part of the proceeds went towards the construction of two schools in Chiang Mai -- the Bangkok Chefs Charity Border Patrol Police School at Ban Mae Long Tai in Om Koi district and Bangkok Chefs Charity Border Patrol Police School at Ban Mae Khor in Mae Chaem district. Bangkok Post PCL and the Bangkok Post Foundation is a supporter of the event. From left, Chiratas Nivatpumin, assistant chief operating officer, Newspaper Business; Bangkok Post editor Soonruth Bunyamanee; Worachai Bhicharnchitr, vice-chairman of the board of directors of the Bangkok Post PCL; Kusuma Bekenn, committee member of the Bangkok Post Foundation; M2F editor Montri Pushatrirat; Panchanida Jansongchai, senior vice-president for advertising and sales at the Bangkok Post; and Nanthana Singkamala, first vice-president, Display Ad.